A few months ago I was at the DoubleTree by Hilton Johor Baru for a food-tasting event when I mentioned my book launch to my host – Marketing & Communications Manager, Grace Chiam – who was absolutely thrilled about it and she enthusiastically suggested to hold it there! It did cross my mind to hold my book launch event at this hotel because it is situated at Jalan Ngee Heng, across the road from where I grew up at our grandfather's house. As Grace enthused about it, I agreed with her that it would indeed by ideal. To make it official, I wrote to the hotel, requesting to check if they can accommodate my event on the given date and time. In five days, I received a reply which read: "I'm pleased to inform you that the date and time has been approved." Throughout the journey to the birth of my book, I met with people with big hearts and the goodwill I received from their kindness and generosity, is rather overwhelming. It started with the grant sponsorship from Think City followed by the advance order for 500 books by Member of Parliament of Johor Baru, Tan Sri Shahrir Abdul Samad, and the goodwill continues. After the hotel’s confirmation of the date and time for my launch event, I received the next message stating that General Manager, Simon McGrath, has offered to sponsor not only the venue but also the light refreshments! We are most happy to support your book launch, which is a further reaffirmation of the relationship we have enjoyed with you since the pre-opening of the hotel. We share your passion for the heritage of Johor and the stories that support the fabric of the history." In another email, Neil Khor of Think City confirmed the attendance of Executive Director, Hamdan Abdul Majeed, at my book launch. The goodwill and generosity of Think City continued as Neil also offered to sponsor the catering of refreshments for the event. All this kindness is indeed heart-warming and since posting, The birth of my book, congratulatory messages have been pouring in, many with queries on how and where to buy the book. I'm deeply touched and encouraged that readers, both local and abroad, are asking how they may get their hands on the book. Messages that came in via Facebook, email and phone texts, echoed such warm sentiments that are both humbling and encouraging. And I'm grateful for each and every kind thought behind their words. My guess is, in their excitement, readers may have overlooked the fact that this book has yet to be launched. "Ms Peggy, I always enjoy your blog about Johor Baru. 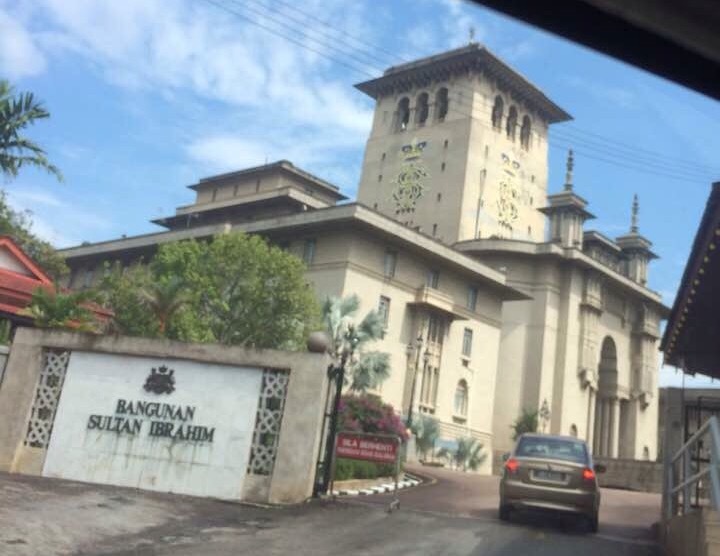 I used to stay in Permas Jaya and often explored the old JB town in the weekend. After I returned to Japan, I still miss and come to JB occasionally. I just read your latest entry about your book. My question is if the book is already available or not. I will come to JB on July 1 so I must purchase a copy at MPH at City Square it is out already. Please let me know. Thank you, Andy." I'm deeply honoured that on his visit to JB, Andy has factored in a visit to MPH Bookstore in City Square to get my book. But the books will not be in the store yet. So the convenience to order the books online, would be ideal for readers like him. Meanwhile the work continues in the preparation for the book launch. This included a visit to the event venue in DoubleTree by Hilton JB, to have a better idea of the room layout. Just as we reached Level 11, who should we meet there but two important men - Simon, the hotel GM and in-coming GM, Daniel Alcaraz. It was certainly my privilege to meet the new GM on an informal basis and I was deeply humbled by the glowing introduction that Simon gave of me. When Simon told Daniel about how I've supported the hotel from the start, I had a sudden flashback to that day when Simon and I toured the hotel in its pre-opening stage. How we walked through the back-of-the-house and I saw the restaurant furniture, still in its plastic wrap! This hotel is a special place to me, not least of which is its location, across the road from where I grew up in our grandfather's house at Jalan Ngee Heng. To all my well-wishers, please accept my thanks and deep appreciation for your thoughtful messages. It means a lot to me. Last year, as I adjusted to the loss of my dad, I embraced the God-given emotions of sadness and grief as part of my journey through this temporal life. A book was the furthest thing on my mind. Last year I also met the people at Think City who enjoyed reading my blog and felt that My Johor Stories should be published in a book to document a slice of Johor heritage. Familiar with My Johor Stories, Think City’s Chief Operating Officer, Neil Khor, was both encouraging and adamant. He wanted my book to come out by the first quarter of this year. I politely shrugged it off as I was in no frame of mind to work on a book. The idea of publishing a book is not foreign to me because a long time ago, my cousin Bernice, an ardent fan of my stories, was already urging me to publish my book! My first book however, was not about me but an autobiography of Colleen M. Redit, a Christian missionary in India who established Christian Missions Charitable Trust in Chennai. Published in 2013, it is being distributed worldwide through the churches. As Think City continued to urge me to apply for a grant and start working on a book, I finally went online for a look at their grant application form. The form was not difficult to navigate but because I was not ready to embark on such a venture, I put it aside. In January, on the first year anniversary of dad’s passing, our family honoured his memory by eating some of his favourite food. Knowing dad, he would have been both amused and pleased with how we celebrated his life. My past year was marked by special dates and events where dad was dearly missed. He was my pillar of strength and inspiration through the many ups and downs of my colourful career. I know he would like me to take up a new challenge. Pondering on this, I took another look at Think City’s grant application form. Embarking on a book project is a deeply personal journey because I must read and review the manuscript and look at photographs from dad’s old albums. It would be both heart-rending and emotional but I decided to steel myself to do it as a tribute to dad. As the wheels in my mind started to turn, a picture of how my book would look like began to form in my mind’s eye. With hardcover, in a size which is comfortable to hold and carry around, and beautifully bound so that it would be an ideal gift. But I could only see it in my mind. I had to get something tangible to show and touch and feel. So I visited bookstores to check out some books and tried to visualise how – one day – my book may be among those books. I went from Popular and Harris book stores here to Kinokuniya Books across the causeway, and came away with a more realistic idea of how my book would look and feel. I’m also required to provide estimated printing costs in the grant application form, so I looked to my friend, Gwen Chia, who has a wealth of printing experience with Autoprint. She knows about paper, printing and prices, and was in a position to advise me on the costs involved for the book I have in mind. I was amused and much encouraged by her keen interest and this made me focus on the project to get my book out so that Gwen could present it to her friends. I may know little about publishing a book but I have friends who have self-published their books. When I told them about my plans, my heart was warmed by the way they volunteered help from software to sourcing for printers, saying that they were more than willing to render some help! This generous offer set me thinking about how I may find professional skills from among my circle of friends. After all, they are talents with specific sets of skills whom I can engage to work with me in this project. While all these thoughts were brewing in my mind, I completed the application form and submitted it to Think City by end January 2017 so that it may be tabled at their Board Meeting in February. After the Chinese New Year break, I received an email from Think City’s Faezah Ayub congratulating me on the approval of my application, with an invitation to join them for a Grants Workshop on February 22. Suddenly my book project became a reality. With my grant approved, I was told that the proverbial clock is ticking and I must get down to serious work so that I can deliver what was required from a grantee. At the Workshop, I learnt that the grants only made up part of the total cost of the project and grantees were expected to seek co-funders. Each grantee would also enter into an agreement with Think City to deliver what was agreed according to Milestones. The next few weeks were a frenzy of activities. 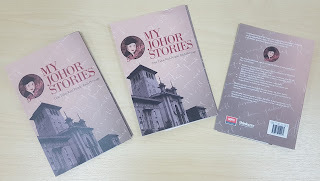 While I put much thought into selecting the material to go into the manuscript, I also engaged an editor and a designer to create the cover design for My Johor Stories, the book. Editor, Cheong Yun Wan better known as Yun, kept me on my toes – quizzing me about questionable words or phrases in its context, and made sure every comma and full-stop were at its right place. She and I kept up a consistent pace of work and we completed reviewing the manuscript to our satisfaction within a short space of time. A long time ago, Phil A. Dominic of Remarco Direction and I were colleagues; he was Art Director while I was copywriter in JB’s then foremost ad agency. By following My Johor Stories online, he kept in touch with me and clearly identified dad’s role in my life. With this in mind, he used essential elements including my avatar, a brand identity created by Chris Parry, co-founder of my blog, to come up with a cover concept that distinctly reflected the essence of My Johor Stories. Meanwhile I was also thinking of someone to write the Foreword for my book. He should be one who is not only closely associated with Johor but also aware of my work. 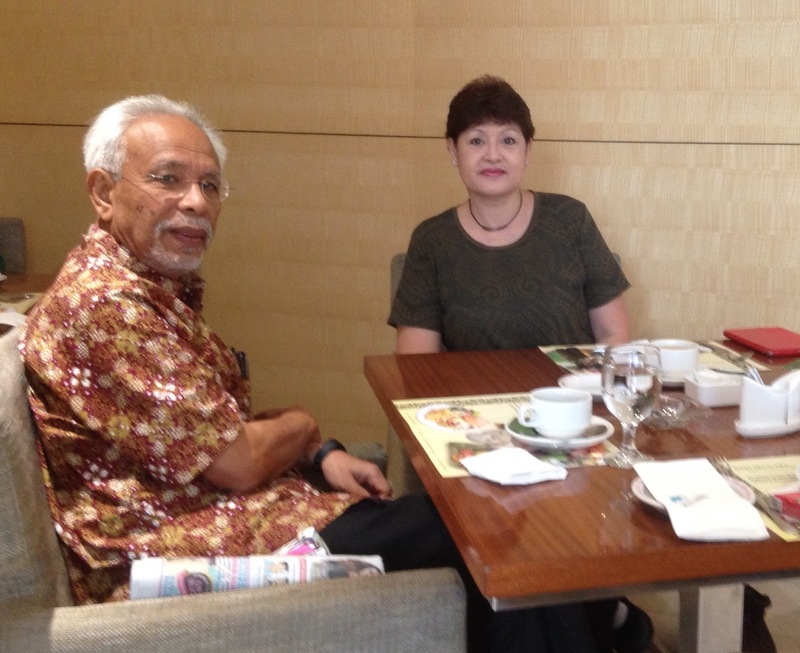 As I turned back the pages in my mind to past community events, I remembered Member of Parliament of Johor Baru, Tan Sri Shahrir Abdul Samad, the way his speeches were usually spoken off his cuff and how he often made reference to my work. I thought it would be ideal if Tan Sri wrote the Foreword! When I met with Tan Sri to talk about it, he not only graciously accepted my invitation to write the Foreword but he also generously placed an advance order for 500 copies of my books to distribute to the libraries of all the secondary schools in his constituency! His overwhelming support simply stunned me. Later as a mulled over how 500 copies of my books were sold even before they were printed or published, I was deeply humbled. With an advance order at the back of my mind, I set to work with renewed vigor. I juggled my work with the editor, designer and layout artist to get the manuscript ready to meet my next Milestone with Think City – to deliver a mock-up of the book. Believe me, it was no mean feat to juggle the jobs and keep all those ‘balls’ safely in the air! So I shared with the Cheong’s about my book project and how it was coming together beautifully. With the final manuscript almost ready, I then needed a publisher to help with the book distribution. It turned out that they have a friend in publishing and proposed to share with him about my project to see how he may be able to help. A few days later, I received an email message from the General Manager of MPH Publishing in Kuala Lumpur who told me that MPH is keen to explore a publishing opportunity with me. It was uncanny how GM, Sze Mei, in our first conversation, said she remembers me from the book launch of Professor Datin Dr. Jamilah Ariffin in Hilton Petaling Jaya! It was like a lifetime ago but in 2002, I worked with Prof Jamilah, wife of then Johor Menteri Besar Dato’ Abdul Ghani Othman, to prepare her manuscript for publishing and I was part of her team at the book launch. Prof Jamilah, a sociologist, published several books and some of my features on her community work published in the New Straits Times, Streets Johor, were also quoted in her book, The Professor and the Juita NGO – Smart partnership in social welfare work. Then Sze Mei briefly explained how MPH Publishing would handle the printing, publishing, distribution, marketing and promotions for my book, and all I had to do was to hand over the final files. We took some time to negotiate the terms of the agreement and determine the first-run quantity, taking into account the advance order for 500 books. Finally, we reached an agreement to publish My Johor Stories - True Tales, Real People, Rich Heritage in hardcover and softcover versions. Meanwhile to meet my next Milestone with Think City, the layout artist was laying-out my manuscript, closely supervised by Gwen, to get the mock-up copy of the book ready. Throughout the project, Gwen had gone the extra mile to help. However on that day when the mock-up book was done, I could not meet her to collect it so she offered to send it over on her way home. I told her to slip it into my letterbox but to ensure that it was properly wrapped and waterproof, just in case it rained. Gwen did better than that. She took photos of the mock-up books and sent them to me because she knew how anxious I was to have the first glimpse of my book! I was thrilled to see, hold and feel [even] the mock-up copy of my book and I cannot imagine how it would be like to finally have the printed editions. This mock-up book was then submitted to Think City to meet the agreed Milestone. Later when I met Neil again at Think City, he was waving my mock-up book enthusiastically and congratulating me repeatedly. He told me how he was enjoying reading my book and discovering more about me and my family. Thanks to Neil, who believed in my book from the outset, we were now holding the mock-up book. While it was still at the mock-up stage, he was so kind as to assure me that to him, the project was as good as done! Meanwhile the final files are with MPH Publishing and their team is working with me to modify the cover design and make the necessary adjustments to the manuscript before it goes to print. It’s mind-boggling but very soon, my book will be available nationwide at good book stores in the MPH distribution network like MPH, Popular, Times and Borders. Looking back, the arduous journey to the birth of my book can be summarized in these words: exciting, eventful and very emotional. 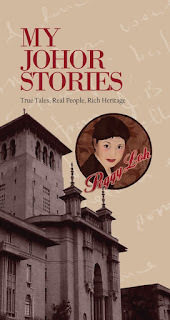 But it is all worthwhile because now readers can enjoy My Johor Stories - True Tales, Real People, Rich Heritage, a collection of short stories with photographs of my ‘grandfather stories’ as well as stories about Johor personalities and heritage. Now Tan Sri Shahrir Abdul Samad has graciously consented to launch my book at a simple event being planned at a place which is situated across the road from where I grew up in Johor Baru. But more about that later. 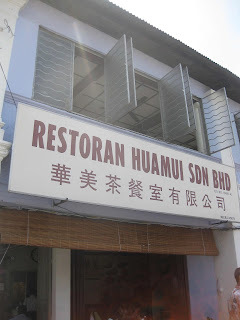 On our walks to the town library, a building located beside the Johor Baru Post Office in the 1970s, I was introduced to Hua Mui restaurant by my street-smart schoolmates. If we had extra pocket money, it was always a treat to order a snack or a cold drink here. Since the 1950s this landmark double-storey coffee-shop on Jalan Trus was run by the Chiang family and its clientele then was mainly European government officers, their friends and families. Located within walking distance from the Sultan Ibrahim Building at Bukit Timbalan, it was easily accessible to civil servants who worked in the state administrative office. Its popularity must also be attributed the menu of European dishes that were prepared with a Hainanese touch. While its business started as a traditional kopitiam furnished by wooden marble-topped tables with the ubiquitous spittoon below them, the upstairs section sported a modern design with private booths that lined one wall of the dining hall. The two floors are linked by a wooden staircase and every step creaks underfoot probably because over the years, thousands of diners must have walked up and down this same flight of stairs. Now the booths upstairs have been removed and replaced by dining tables but the ambiance remains virtually unchanged. Ceiling fans whir above while the banks of windows along two walls of this corner shop are thrown open for cross-ventilation breezes to cool its interior naturally. Another unique feature of Hua Mui restaurant must be its ancient dumbwaiter. With its kitchen downstairs, food and drinks are conveniently hoisted up through an air-well and used tableware are lowered down for washing! Now operating under a new management, Hua Mui continues to be a regular rendezvous for retirees who enjoy reminiscing over cups of coffee. While it remains the restaurant of choice for many locals and lawyers, its colonial charm keeps young people and tourists coming in for a taste of nostalgia. In Johor Baru’s coffee-shop circle, Hong Say Tee, an entrepreneur who arrived here from China’s Fukien Province in 1935, earned his reputation as JB’s Coffee-shop King because he made a name for himself as a leading owner of coffee-shops and cafes here. I met Hong during an event in 2011 where he used old photographs to give the audience a glimpse of life here in pre-war days to the 1950s and early 1970s. Aware of the tastes of the British then in Johor, Hong, an innovative pioneer, transformed traditional coffee-shops into modern cafes and snack-bars. It was Hong who first opened modern coffee-houses like Wato Inn and Wato Snack Bar along Jalan Ibrahim. 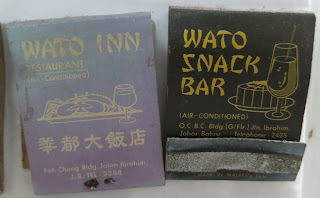 Wato Snack Bar on the ground floor of the OCBC Building and Wato Inn on the ground floor of the Foh Chong Building were then considered posh dining destinations because customers could dine in air-conditioned comfort. This was probably where most guys would impress their dates with fancy drinks like Coke Float or 7-Up Float, served in tall glasses topped with a scoop of vanilla ice-cream. Besides a menu of European and local dishes, a range of flavoured milk-shakes and Banana Split ice-creams, Wato would be best remembered for their warm and delicious curry puffs and chicken pies. With the success of Wato, Hong opened yet another coffee-house at Jalan Segget. Lady Jade or LJ in short, had a musician to provide live entertainment and served a menu similar to Wato, including those popular chicken pies in flaky pastry! 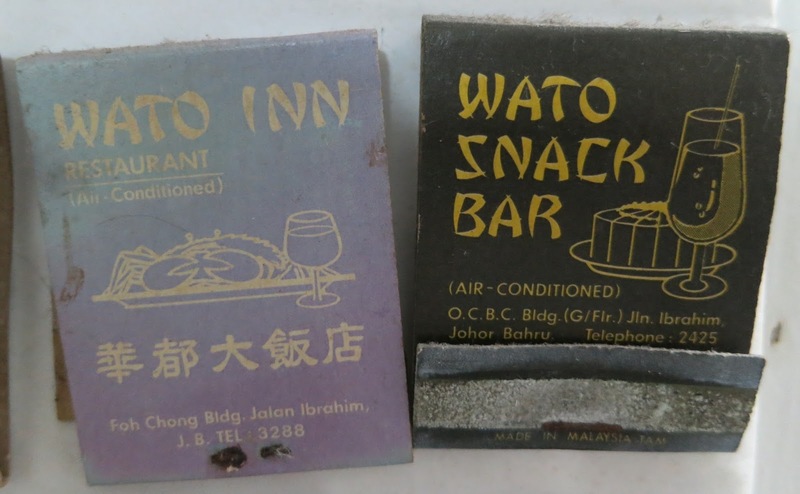 The Wato brand was further developed into Hotel Wato Inn situated at Jalan Bukit Meldrum where it also had a Taiwan Porridge Restaurant and coffee-house. At the top of Jalan Wong Ah Fook, there once was Bangunan Aziza, a prestigious address in the 1970s which housed the Orchid Hotel, before it was known as Pan Global Plaza. The Scene coffee-house was on its ground floor while Bilek Anggerik or Orchid Room upstairs was a preferred destination for fine dining. There was even a club in this building for Malay live music and dancing with entertainment in popular dangdut and pop-yeah-yeah genres. 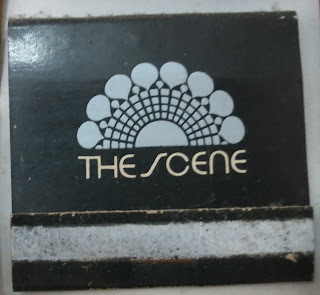 The Scene coffee-house transformed into a club with live music and disco dancing for weekend Tea Dances and disco nights. This was also where the career of JB’s foremost rock band, The Heavy Machine, was successfully launched. 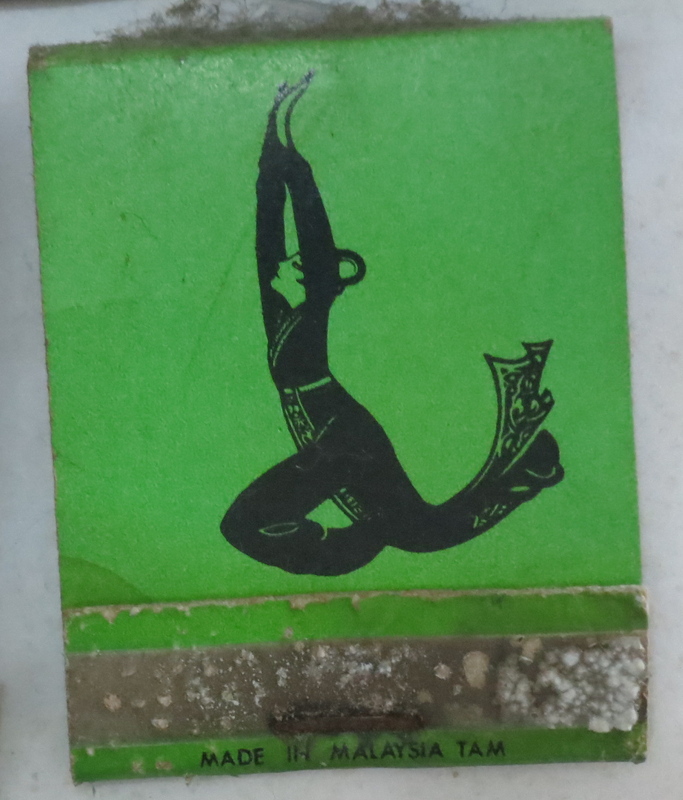 While many pop groups emerged in Johor between the 1960s and the 1980s, The Heavy Machine established a strong reputation and became synonymous with The Scene. I fondly recall the band’s glittering costumes with matching platform shoes, their synchronized movements, highly polished brass section and the way they rocked the crowd! With raw talent and huge popularity, it didn’t take long before they were talent-spotted and awarded contracts to perform in the capital city. This 7-piece band left for the bright lights of Kuala Lumpur where they became renowned in the clubbing scene as JB’s most successful band and was dubbed the ‘Chicago of Malaysia’ after the American rock band, Chicago. As more hotels, restaurants, cafés and entertainment options opened in JB, Orchid Hotel ceased operations and the building has since been demolished. Among the new openings were Tropical Inn at Jalan Gereja and Hotel Regent Elite at the corner of Jalan Siu Nam and Jalan Meldrum, with The Ranch coffee-house on its ground floor. Incidentally, all the early coffee-houses mentioned here, have ceased to exist while Hua Mui restaurant remains popular and continues to serve new generations of diners. The partnership between Coca-Cola Refreshments Malaysia and Legoland Malaysia Resort which started five years ago, was recently renewed for a further five years in a signing ceremony. Legoland Malaysia Resort General Manager, Kurt Stocks, signed the renewal of partnership on behalf of the resort with Commercial Director of Coca-Cola Bottling Investment Group Singapore, Malaysia and Brunei, Gareth McGeown. This year marks the fifth year anniversary of Legoland Malaysia Resort and it is significant that Coca-Cola Refreshments Malaysia was the resort’s pioneering strategic partner since day one. “We are happy that the ties are getting stronger as we look forward to the next five years,” said Stocks. “I believe this partnership will support both our brands in many positive ways and will add value to our guests’ experience,” he added. To mark this momentous occasion, an exclusive Coca-Cola truck with fun and engaging activities was set up in front of The Big Shop for guests to enjoy games and win special merchandise. In celebration of this partnership, both brands are collaborating in a special promotion to coincide with the Ramadan and Hari Raya Aidilfitri season. From now till July 30, shoppers at Giant, Aeon and Aeon Big outlets nationwide who purchase four or 12 cans per packs of Coca-Cola, Coca-Cola Zero Sugar, Coca-Cola Light, Fanta, Sprite, Heaven and Earth tea range and Minute Maid Pulpy juice drinks will receive RM88 discount off for a purchase of a 1-day combo ticket to Legoland Malaysia Resort. Just look for the promotion sticker that comes with each drink pack and save the sticker to redeem the ticket discount at the resort’s ticketing counter. One sticker will entitle the holder to the discount on one combo ticket. For more info on promotion and activities, visit Legoland Malaysia Resort’s official website on www.legoland.com.my and stay connected with the resort via social handles Facebook and Twitter to find out more on online activities and promotions. Pride. That feeling coursed over me when I found myself at the recent sneak peek of the final episode of the design reality television series, The Apartment: Rising Stars Edition. The 10 episodes for the worldwide search for the next design superstar was filmed at Bandar Seri Alam in Johor Baru. My hometown. Viewers across Asia followed the exciting and often nerve-racking journey of 12 contestants from around the world as they battled to win the coveted title as interior design superstar. But it was interesting that the Season Five contestants were challenged to create their unique designs within nine units of link houses instead of apartments even though the show is dubbed, The Apartment. The show featured celebrity judges that included international award-wining designer Jamie Durie, world renowned interior designer and business mogul, Laurence Llewlyn-Bowen and American design superstar, Genevieve Gorder. It was another feather in the cap for UMLand, the award-winning Malaysian developer of Bandar Seri Alam, to have its properties featured in Asia’s biggest design show. For ten weeks, the contestants from nations like Australia, Brazil, Chile, Poland, the Philippines, Thailand, the United States of America and two Malaysians, lived, worked and created together in Bandar Seri Alam. At the end of every episode, the contestants met at the show’s design court, a set located within the Medini Lakeside Gallery, where one of the bottom two contestants was eliminated. After nine grueling episodes, the contestants were whittled down to two: Aleksandra Flasz, 27, from Poland and Malaysian, Winston See, 31. Flasz, a full-time model who studied fashion in Vietnam, took part in the show to gain some television experience. She combined design with fashion and art to create something special to emerge the winner of the show’s US$100,000 (RM427,700) prize and coveted title of design superstar. Meanwhile Malaysia’s representative, See, an architect by training, came close to winning but had to settle for invaluable experience and plenty of home love. Clad in a crisp white shirt and tan trousers, See looked a vision of laid-back casual, quite unlike the more formal suit and bow-tie he sported for the filming of the season finale. The Johor-born See shares that his formative years were spent in Kulai. His father’s work brought the family to Johor and he fondly remembers Jalan Perpaduan, the name of the road where they lived until he was 12. The youngest of five siblings, See has three sisters, two of whom are architects. When the family moved back to Kuala Lumpur, he went to school in Shah Alam where he improved his command of Malay, thanks to the company of Malay friends. Just like most youngsters then, See enjoyed playing computer games and his favourite was The Sims, a life simulation video game where virtual people are created to live in houses, either pre-constructed or built by them. It was during these countless hours immersed in this game that it dawned on See that he was largely focused on creating buildings. This interest in buildings eventually led him to seriously consider a career in architecture. Having two older sisters who are architects also probably had some influence in his decision too. But the conviction to pursue the path, shares See, grew stronger when his second sister advised him not to take it up for financial reasons. He grew even more determined to pursue this course of studies! After completing Form Five, See enrolled in a foundation course at Limkokwing University of Creative Technology. His family was not wealthy but his father managed to pay for his one-way ticket and gave him just BP100 (RM550) pocket money when he left for Robert Gordon University in Scotland. Upon arrival, even before he unpacked, See went out to look for a job. His goal at that time, was to earn his keep, find the cheapest way to live and not be a financial burden to his parents. The four years abroad was probably the toughest time of his life as See juggled three part-time jobs while he studied. Besides washing dishes, he was a waiter and also worked with a small architectural firm. While he worked and saved to pay his own way, he was grateful that his sisters chipped in to help him pay the tuition fees for his first year. It was indeed a momentous day, confides See, when his oldest sister, an architect who was then based in London, witnessed his graduation. While he had a choice to work in the UK, See decided to return to Malaysia where he joined BEP Arkitek and started his career as an architectural assistant. 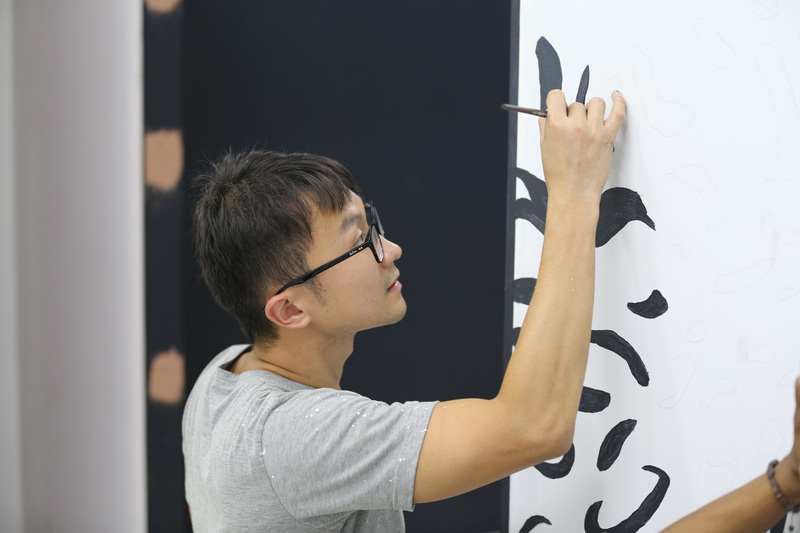 Over the span of six years, See was given opportunities to explore his creativity and soon discovered his passion for design. Around this time, he also met his soulmate, Amy Ang Yi-Mae, also a designer, and they were married last May. Sheepishly, See confesses that he had no idea what The Apartment was all about until his wife suggested they join the contest as a pair of contestants. When they registered, they were not aware that this season’s format was for individuals and not for pairs. After a series of three interviews, See and his wife successfully qualified as contestants. But just before the start of the series, Amy suffered a miscarriage and had to drop out of the show. In spite of this temporary setback, See was encouraged to carry on with the challenge. With his wife as his inspiration, he was determined to complete the journey to the best of his ability. The first thing he had to do was to move into a house in Bandar Seri Alam which he would share with 11 contestants. He recalls that at first, it was tough as there were strict rules about communicating with family. Every few days their mobile phones would be returned for about an hour for them to make calls. Despite having lived abroad, See realised that he lacked social skills and experience for social interaction with his housemates. A lot of this had to do with the fact that when he was not studying, he was working hard at his three part-time jobs. With the exception of Ernest Loh, the other Malaysian contestant, See initially struggled to live together with the others who came from various ethnic backgrounds. Looking back, See said that the first two episodes were the most difficult for him because he had to deal not only with different personalities but also different design principles. While his instincts compelled him to flee from difficult situations, he reminded himself that he was there to learn. As he got better acquainted with the other contestants over the next few weeks, See noticed that as they rose to the daily challenges, the contestants learned to contribute and to participate as a team. From the start, See had made himself a pledge – not to be the first to leave the contest – and it was a close call when he ended up in the bottom two on the first episode. But after that, there was not looking back for him. Smiling, he shares that as a team leader, he was extremely proud of the fact that his team didn’t lose, not even once. By the time they reached episode nine, the remaining four contestants, who by then had developed a very close bond, found it incredibly difficult to see the bottom two leave. But in an exciting twist of the game, the final two contestants, Flasz and See, were given the opportunity to pick a partner from the bottom two to accomplish the final challenge. While Flasz teamed up with Andres Luer, See partnered with Ally Marrotte. Curious, I ask See about his use of contrasting colours and the uneven edges in his floor design. He explains how this was a flow pattern he designed to guide guests towards the kitchen, which is usually the heart of the home, and onwards to the master-bedroom and bathroom. In the bedroom, See designed the wardrobe in a dark masculine shade while the dark leopard spots that he painstakingly painted on the white wall, act as a point of seduction. He explains that the image of the leopard introduces a feminine element in the otherwise masculine room. It’s also a reflection of his wife’s femininity and feisty character. Having gone through the struggles and successes in his years in the UK and on The Apartment, See admits that he noticed a common thread throughout – that he would push his limits if he were doing it for someone else. In the UK, it for his parents and in The Apartment: Rising Stars Edition, he was doing it for his wife. The affable designer confides that not many people know that his first ambition was to become a psychologist. Now that he has found his passion in architecture and interior design, his principle is to combine his first love – to listen to his clients and understand their personalities – with his talent and creativity, before designing something which matched with their tastes. Suffice to say, See has certainly been enriched by his participation in The Apartment: Rising Stars Edition, and has achieved much – personally and professionally – from the experience. While he has established himself as somewhat of a local celebrity, See is content to return to his day job at his design house, Paperspace in Petaling Jaya, where he applies his wealth of experience to creating something special for his clients.